More than any other series in Nintendo’s library, the Legend Of Zelda is about the thrill of exploration. It’s been that way since the first game, which dropped players in a vast, hostile world, tossed a sword in their hands and a pile of graph paper at their feet, and set them loose on the Moblin-infested wilderness of Hyrule. But as the years have passed, and gaming has evolved, designers have realized it’s not enough to give players a wild, dangerous place to move around in; you also have to make the moving itself feel fun. The original Legend Of Zelda made a few nods to that idea, giving Link a speedy default pace and letting him teleport around the world with a magical warping whistle. But it wasn’t until 1991’s A Link To The Past that Nintendo made the process of moving through Hyrule more than a means to an end. Zelda verbs have always come in the form of new items, and Link To The Past wastes little time introducing players to its most kinetic new treasure. The Pegasus Shoes arrive within the first few hours of the game, shortly after series mainstays like the boomerang, the bow, and the bomb. Controlling a player’s speed is a fundamental tool of game design—the original Super Mario Bros. drew as much of its genius from the B button’s dashing as it did the A button’s jumps—but the Pegasus Shoes aren’t just a simple run button slapped onto the game to make things move a little more quickly. They also provide a gleeful recklessness. Hold the A button, and Link shuffles his feet for a moment before rocketing across the screen, kicking up dust along his path. There’s a freedom in that dash, emphasized by Link becoming quasi-invincible while he’s doing it, cutting through grass and knocking enemies aside with his sword extended. And the sound effects that accompany it play up the abandon as well: First, the pitter-patter of Link’s feet as the dash charges up, followed by the satisfying thump when Link slams into an immovable object and bounces backward. The funny thing about the Shoes (or Boots, in some games) is that they’re not really any faster than Link’s normal walk. Any time saved by the dash is inevitably spent repositioning yourself or bouncing off of walls. But they feel faster, because the movement comes in giddy bursts instead of a stolid pace. It’s purely psychological, but it works. The Pegasus Shoes have never made a true transition to the 3-D Zeldas, where mad dashing would hamstring the already tenuous precision of the controls. (The closest that Ocarina Of Time gets is the slippery-but-restrained Hover Boots, while Majora’s Mask offers a simple speed boost in the form of the Bunny Hood.) But that feeling of out-of-control forward momentum lives on in Link’s newfound ability to roll. Like the dash, rolling sacrifices Link’s control (and sometimes dignity) in exchange for a perceived burst of speed, all the way down to playing a similarly thuddy-thump when he inevitably slams face-first into a wall. And, like the Shoes, rolling offers nothing more than a negligible speed boost, a fact that hasn’t stopped whole generations of players from somersaulting their way across Hyrule like a bunch of deranged elven acrobats. A Link To The Past isn’t the only Zelda game to understand the importance of presenting players with joyful movement while exploring a massive world. Its successor, the Game Boy title Link’s Awakening, went even further, adding in the free-form pleasure of the Roc’s Feather, which granted the ability to jump. (Combine the Feather and the Shoes, meanwhile, and now you’re basically flying across the map.) 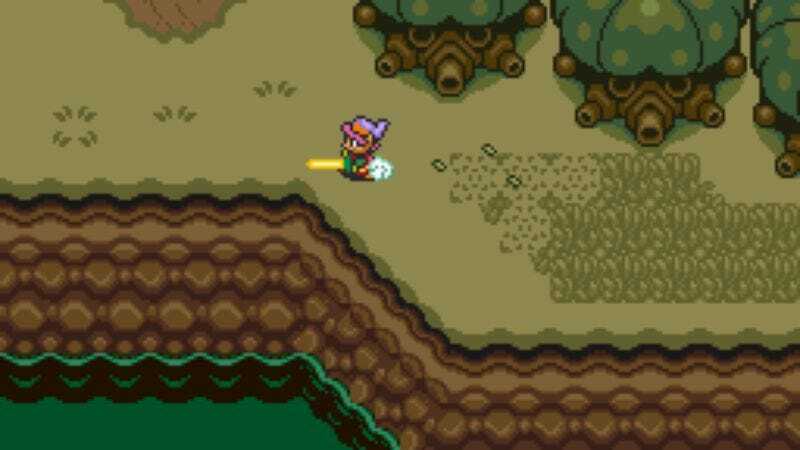 But A Link To The Past—which turns 25 years old today—did it first, turning Link from a stoic plodder into a dashing maniac and leaving the series all the better.